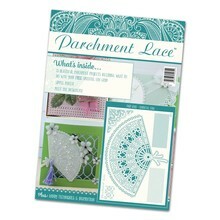 Welcome to Issue 5 of the Parchment Lace magazine! We are very excited to share this magazine with you as we have all been working hard giving this magazine a revamp! We hope you love it as much as we do! Incl. GRATIS A6 "Multigrid"
It's Christmas!!! Well in the crafting world it is anyway! We are excited to introduce our first ever Christmas Issue of the Parchment Lace Magazine! We really do have a treat for you with 32 pages of step by step projects. Engelstalig magazine. Hello and a very warm welcome to Issue 4 of the Parchment Lace Magazine. We have a stunning and diverse array of fabulous patterns and projects for you to enjoy in this issue. Incl. 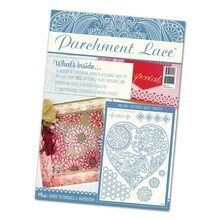 GRATIS A6 "Multigrid"
Again, this month we have some fabulous patterns from the talented team here at Parchment Lace. We are joined by our guest designer, Maria Maidment, who has treated us with her stunning fan design. (Engelse tekst) Incl. GRATIS A6 "Multigrid"
Welcome to the very first issue of our new Parchment Lace Magazine, with our Beautiful Fan Grid absolutely free! (Engelse tekst) Inclusief GRATIS "Multigrid" op A6 formaat.